Don’t make your trees work around your new deck. Make your new deck work around your trees. The railing of the deck above is beautiful and has a very interesting feature. 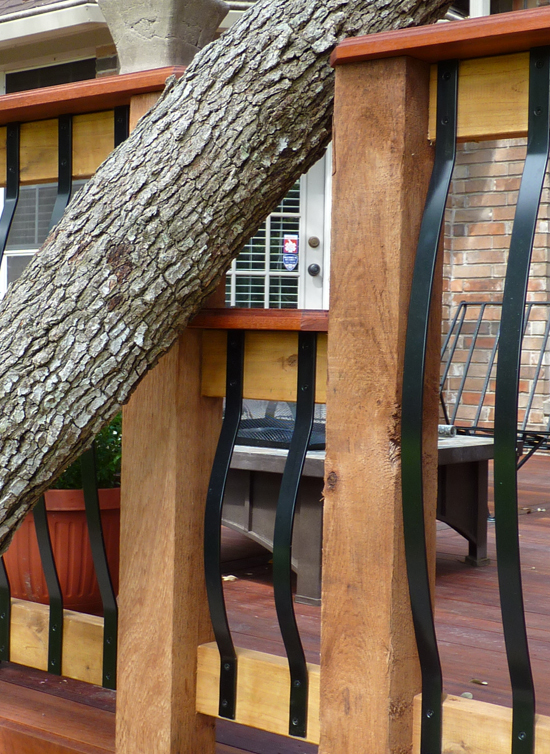 The railing is specially tailored to work with the gorgeous tree in the yard. As you can see in the video above, the yard had several of these old trees and one hung over where the deck was going to be built. One of the things Marc Mommsen noted to me when he was telling me this deck is what went in to modifying the railing to fit this cut out area. The metal pickets only came in the larger size. So they had to cut the rails, heat them and re-bend them for the new smaller size. This is the great thing about getting a custom project by a custom builder. You don’t have to make a stock product work for you. Make the builder work for you so that everything fits with your lifestyle, your yard, and your outdoor living needs and wants. As far as materials go, this deck incorporates the very popular tigerwood – a Brazilian hardwood with an exceptionally long lifespan. 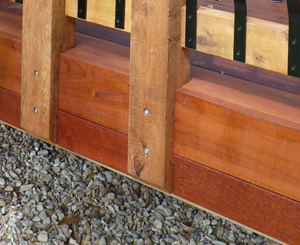 The tigerwood is also used for the rail caps and cedar is used for the posts. The tigerwood planks are a full inch thick and they are used in a 6-4 pattern. Six-inch wide planks alternate with 4-inch wide planks for nice aesthetic detail. Because this deck is very wide, an inlay is used toward the middle for an attractive method of adjoining multiple planks made necessary by the extensive width of the deck. Here is another video of Marc discussing this technique. Give us a call for design ideas for your outdoor space. The consultation is always free. More importantly – Happy holidays from all of us here at Archadeck of Austin! This entry was posted on December 21, 2010 by 33social. It was filed under Austin decks and was tagged with Archadeck of Austin, Austin decks, Austin tiger wood, Austin tigerwood, decks with tree hole, tigerwood decks austin, Tree in middle of deck.